Two key decisions are required when commissioning a transfer system. The first is whether to fit a Breakaway Coupling or Emergency Release Coupling. The second is determining to what specification and make of system. Breakaway elements within a transfer system allow separation and controlled shut off of flow at times of system stress caused either by inadvertent vehicle movement or pressure surge. Where a Breakaway closure system is not fitted then uncontrolled spillage can injure personnel, damage assets and contaminate the environment. Along with short-term costs such as downtime, project delay and clean-up, the risk of longer term damage to the environment, reputation and legal consequences provide a valuable commercial perspective. Fitting a Breakaway with a closure element within a transfer system is a relative and cost-efficient investment in assets and a demonstration of due diligence in project management. KLAW 100% closure couplings, along with the benefit of minimal headloss, provide a meaningful and strong benefit/risk conclusion. This in turn provides companies with compliance and calculable risk solutions for new transfer systems and also improved performance on existing systems by retrofitting a Breakaway Coupling into the current transfer solution. The cost of KLAW BAC and ERC systems is relatively small when compared to the potential damage caused by an unpredictable and uncontrolled spill. Transfer systems can be put out of action for weeks or months when medium containers and vehicles are damaged or contaminated due to spills. KLAW products help reduce risk to the environment and avoid the potential consequences of a transfer event. Recently within the oil and gas industry, there have been major environmental concerns and operational issues that have led to repercussions and heavy fines being imposed due to damage to the environment. By using KLAW breakaway systems, companies are being enabled to control the cost of environment protection and limit the risk of environmental impact when an event occurs. Recent environmental incidents such as earthquakes, tsunami and other marine and inland extreme weather events such as storms and floods have provoked recognition to deliver systems that minimise consequences and to develop options to avert personnel injury and damage cause by product leakage when an environmental event occurs. Marine terminals, bridges carrying fluid transfer pipelines and any industrial complex involved with product transfer will benefit from integrating KLAW products into its transfer system. Government bodies are imposing more restrictions and regulations relating to safety and the environment, with legal developments evolving towards the requirement to take the necessary precautions by investing in reliable and proven transfer systems. A spill event means you have lost control of the transfer. In many cases you will also have lost control over the consequences of the spill. The effect on the project is immediate in that the transfer is stopped and delayed. Downtime due to the clean-up of assets and the environment, managing potential workforce injuries and damage to assets may take weeks or months. The cost in management time, distraction from purpose and real costs far outweigh the investment in commissioning and maintaining a Breakaway closure system. A KLAW Breakaway coupling provides event management. When an event takes place, the coupling controls the medium and allows you to control the situation and minimise downtime. Minimising the risk to personnel in hazardous environments is of primary concern and installing a KLAW BAC or ERC into your transfer system is a relatively small investment that can prove crucial in saving your personnel from dangerous exposure, contamination and injury. Owning a KLAW system also clearly demonstrates your ability and intention to take care of those working for you and your partner businesses. KLAW Breakaway systems have been employed around the world and enjoy a reputation for delivering consistent performance. 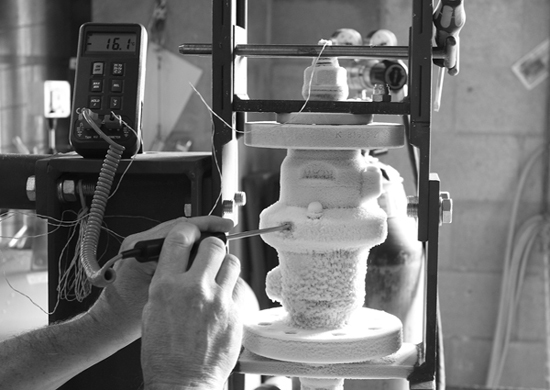 Investment in research and development along with exacting testing and manufacturing procedures confirms KLAW systems perform in the most demanding of circumstances and environments.